There is plenty of reason to be skeptical when this FCC decides to do anything that isn’t a gift to the biggest telecoms in the nation. But on Thursday, it created new rules that could help upstarts like Google Fiber break into wireless and broadband markets. It’s a rare instance in which less regulation might be bad for the handful of companies that dominate the telco industry. The issue the commission addressed yesterday concerns the rules governing the procedure of attaching wires and cells to utility poles. Previously, if a new carrier wanted to deploy their service on public utility poles, they had to wait for the ISPs that were already using the poles to move around their own equipment first. This has led to incumbent carriers having a lot of power to delay a new entrant’s deployment in a market and grind progress to a costly crawl. The FCC’s new rules set forth what’s called a One Touch Make Ready (OTMR) process that allows a new carrier to hang their equipment and make adjustments all by themselves. This means that smaller companies could deploy fiber and 4G and 5G cellular equipment in areas controlled by the likes of Comcast with a lower barrier to entry. In fact, Comcast explicitly opposed an OTMR policy ahead of the ruling, saying that it unfairly benefits new entrants to a market. We reached out to Comcast to ask if it intended to mount any legal challenges to the decision but did not receive a reply. FCC Chairman Ajit Pai may have done something that Comcast doesn’t like, but his former employer, Verizon, will be happy. The company came out in support of OTMR as it plans to expand and upgrade its network to 5G. Google has also endorsed the change with its “full support.” The search giant’s Fiber network has been stalled for years, and it’s placed part of the blame on utility pole regulations slowing its progress. We’ve asked Google if the FCC’s decision will renew its focus on expanding its ISP service and will update this post when we receive a reply. It’s worth noting what a sad state of affairs the telecom industry is currently in when a company as enormous as Google finds it prohibitively difficult to mount any kind of significant competition. But as with all FCC policy, nothing can be simple. 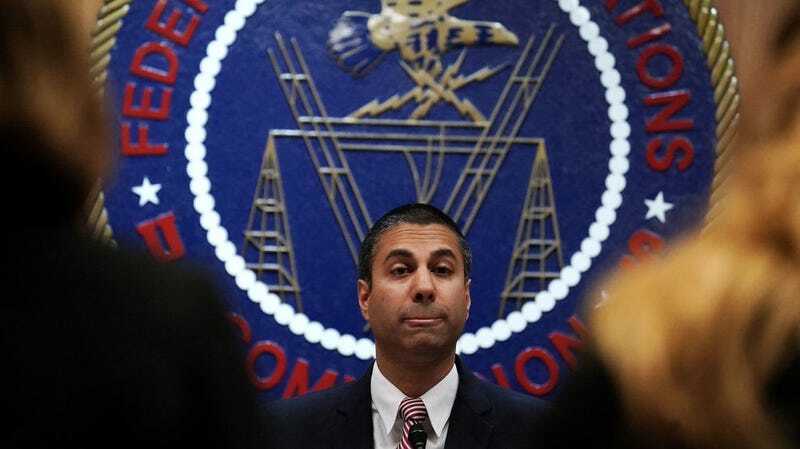 Though the FCC voted unanimously for the new rules, Commissioner Jessica Rosenworcel dissented in part. “First, in our rush to put out rules, this agency accepts too much ambiguity in the one-touch make-ready regime we adopt today,” she wrote. Rosenworcel worries that the guidelines may not be clear enough, and sloppy drafting may simply lead to legal disputes that actually slow down deployment. The commissioner also said she’s concerned that there’s been no consideration of existing attachers and union workers that have collective bargaining contracts that could be invalidated by the new rules. She worries this too could lead to legal disputes or simply putting these workers out of a job. What’s more, she believes the commission’s trust in existing contract and tort law to protect workers is dangerous and ill-advised. However this shakes out, it’s refreshing to see Ajit Pai do something that isn’t blatantly evil or extremely suspicious. That passes as good news, for now.